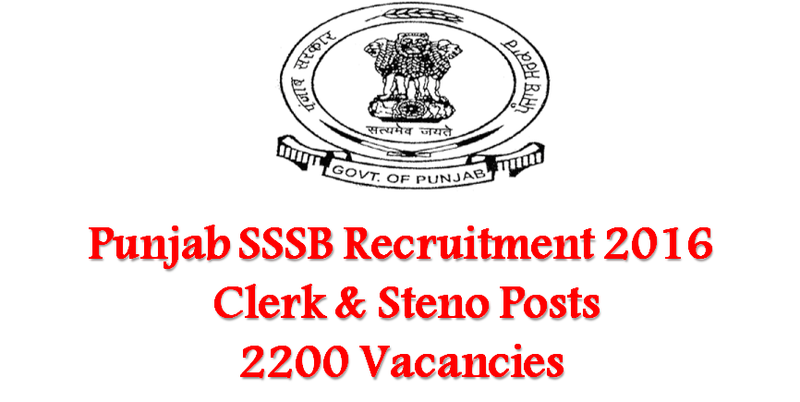 2200 vacancies are open for recruitment under Punjab SSSB for clerk and steno posts. The online application process will continue till 05.00 pm today (27 September 2016). Vacancies are available for Clerk, Clerk and Data Entry Operator, Steno Typist and Junior Scale Stenographer posts at Punjab Subordinate Service Selection Board. Who can apply for Punjab SSSB recruitment? Punjab SSSB has set eligibility criteria for all the above mentioned posts. Only those candidates who satisfy the eligibility criteria can apply for the posts. Candidates are required to have minimum educational qualification of graduation along with O-Level Computer Information Technology course in order to apply against vacancies. In addition to this, candidates are also required to have passed Punjabi language till class 10th level. The age limit for candidates is 18-37 years. What is the selection procedure for Punjab SSSB Recruitment? Candidates will be selected on the basis of their performance in the interview or written examination, whatever will be conducted by the Board. How to Apply for Punjab SSSB Recruitment? Candidates are required to apply online at the official website of Punjab SSSB / punjabsssb.gov.in. The online portal will be open for recruitment till 05.00 pm of 27 September 2016.